Lisa Sorg of N.C. Policy Watch has a lengthy story today about Lee County’s very own Jim Womack, who as chairman of the North Carolina Oil & Gas Commission is overseeing efforts to lift a fracking moratorium in his home county. As chairman of the Oil and Gas Commission, Womack would have the authority to deem the complainants’ petitions complete, and thus be the gatekeeper for the hearings of his associates to proceed. Although the story does not look good for Womack or the Oil & Gas Commission in general, its timing is interesting in that Womack probably felt pretty good about himself as he sipped his coffee this morning. 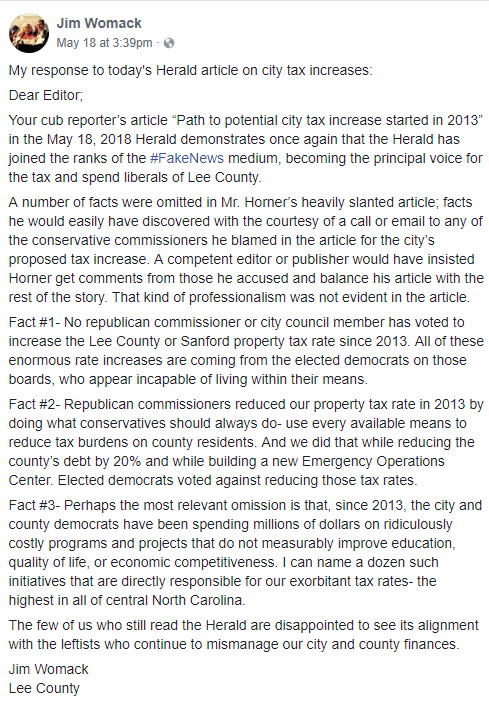 A number of facts were omitted in Mr. Zachary Horner’s heavily slanted article; facts he would easily have discovered with the courtesy of a call or email to any of the conservative commissioners he blamed in the article for the city’s proposed tax increase. A competent editor or publisher would have insisted Horner get comments from those he accused and balance his article with the rest of the story. That kind of professionalism was not evident in the article. You should read Womack’s entire letter (if you’re not a subscriber, Womack helpfully shared his unedited version, which is even more inflammatory, on Facebook) and then Sorg’s story about his performance as chairman of the Oil & Gas Commission. It’ll make your brain hurt, but it’ll also remind you that this guy is still trying to pull strings in Sanford and Lee County, and that you can vote later this year against giving him any additional influence into public affairs.